The Zero Gravity Corporation has been given the thumbs up by the Federal Aviation Administration (FAA) to conduct "weightless flights" for the general public, providing the sensation of floating in space. Tickets are on sale for around $3,000. A specially modified Boeing 727-200 aircraft, called G-Force One, will be used during a nationwide tour Sept. 14-24. "We kick off a two-week tour with Zero-G flights in New York City, Los Angeles, Reno, Dallas, Atlanta, Detroit and Florida," Peter Diamandis, Chairman & Chief Executive Officer of the company, told SPACE.com. The kick-off flights will carry "select consumers and guests," the company announced today. The first flight was slated today to depart from Newark Airport in New Jersey, across the Hudson River from Manhattan. Trips available for everyone else start in October. Diamandis said in a press statement that his firm has teamed up with Diet Rite "to provide Americans with the first opportunity to experience the fun and exhilarating feeling of weightlessness, an experience previously available only to astronauts." The Zero-G Experience offers a full-day program led by a veteran astronaut. Each flyer -- the customer -- experiences Martian gravity (1/3 Earth's gravity, referred to as "g"), lunar gravity (1/6 g) and zero gravity, the sensation of floating freely with no pull from terra firma. The sensation of weightlessness is created inside G-Force One by flying a parabolic flight pattern, specifically a 10,000-foot "roller coaster", which takes place at between 22,000 and 32,000 feet altitude above Earth. The parabolic flight patterns temporarily counteract Earth's gravity, creating weightlessness for several seconds on each of several passes. The experience is "exhilarating and disconcerting," according to a reporter who rode a similar NASA plane known as the Vomit Comet. 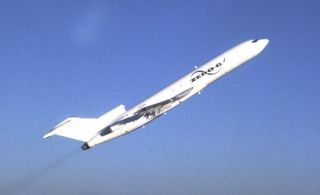 Diamandis began his quest to commercialize zero-gravity airplane flights in the mid-1990s and, in 2000, provided zero-g flights for the film industry. The Zero Gravity Corporation is headquartered in Dania Beach, Florida. Its flight operations are conducted out of Fort Lauderdale-Hollywood International Airport. More details and information about tickets and prices are available at the company's web site, www.nogravity.com.